In this article, we take a look at Codemods, a tool for making sweeping changes across your code with ease and effectiveness. Codemods are invented by a team of developers from Facebook to assist large-scale migrations in code-base, and we are going to take a deep look into a particular codemod tool called jscodeshift. Its heart is a series of small behavior preserving transformations. Each transformation (called a “refactoring”) does little, but a sequence of these transformations can produce a significant restructuring. Since each refactoring is small, it’s less likely to go wrong. The system is kept fully working after each refactoring, reducing the chances that a system can get seriously broken during the restructuring. But the real motivation behind code refactorings are the smells in your code or some hidden issues lurking in the dark for a very long time, which will eventually pop up during one of the critical moments when your application is trying to do some important task, this code can prove costly or it might bring you a maintenance nightmare time and again. Hence we need to understand these intricate patterns of code causing all these troubles in the first place and then apply proper refactoring mechanisms to remove them completely. Bad smells in code are certain structures in the code that suggest (sometimes they scream for) the possibility of refactoring. 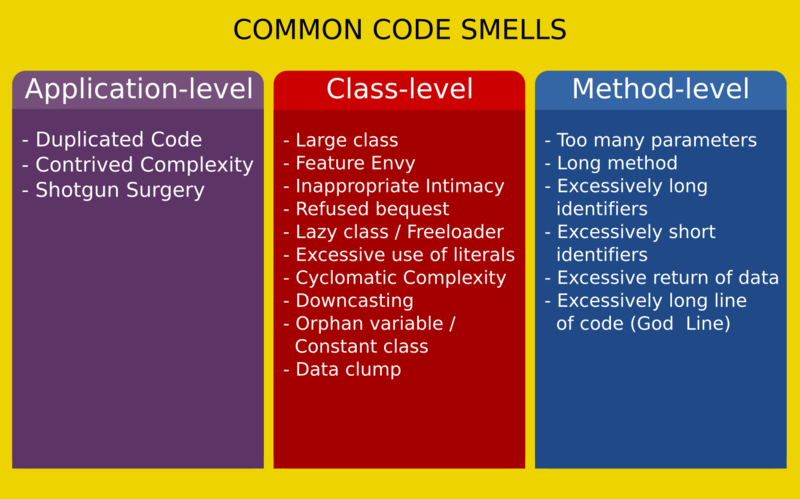 Determining what is and is not a code smell is subjective, and varies by language, developer, and development methodology. In Refactoring, Martin Fowler along with Kent Beck have identified about 20 different kinds of code smells. They have also catalogued the various refactoring methods that can be applied to remove these code smells from your source. A runner, which executes the provided transform for each file passed to it. It also outputs a summary of how many files have (not) been transformed. A wrapper around recast, providing a different API. 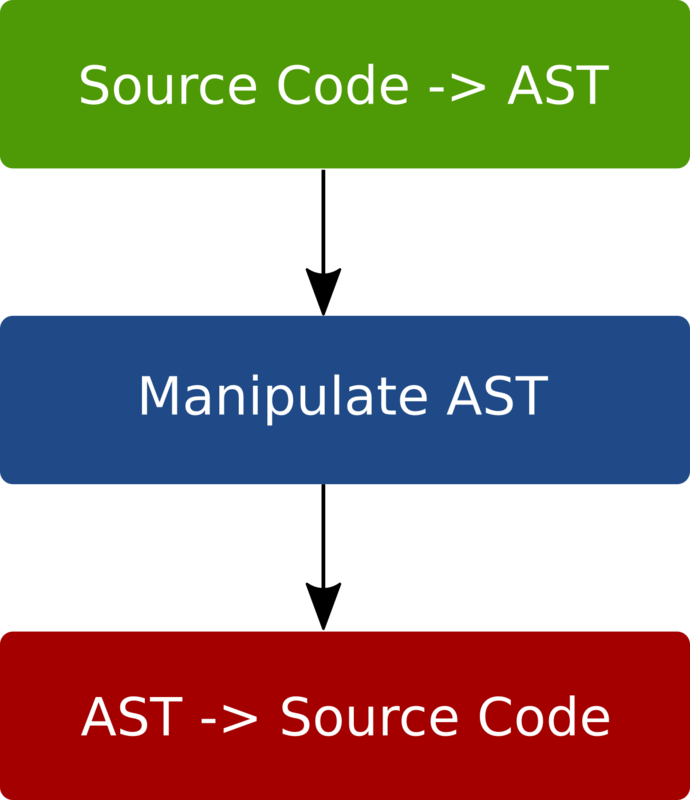 recast is an AST-to-AST transform tool and also tries to preserve the style of original code as much as possible. // Let's turn this function declaration into a variable declaration. // Parse the code using an interface similar to require("esprima").parse. At a very high level, codemods do a very simple processing with your source code like converting it to AST representations, manipulating nodes in the AST and then finally converting the AST back to source code. 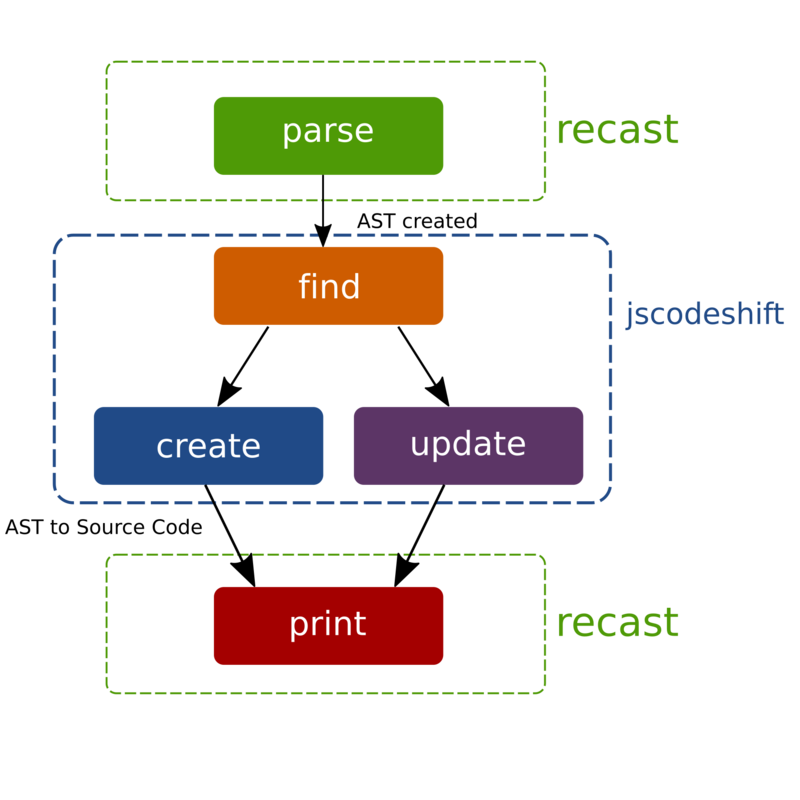 Below you can find the details working of how the jscodeshift and recast tools transform your source code into AST and back to code again. An abstract syntax tree (AST), or just syntax tree, is a tree representation of the abstract syntactic structure of source code written in a programming language. Each node of the tree denotes a construct occurring in the source code. A lot of JS frameworks nowadays relies heavily on codemods to make their migrations seamless, so that their consumers or the developers using the frameworks don’t have to rewrite a lot of stuff while moving on to newer apis or a newer version of the framework itself. Frameworks likeReact, Vue, Angular have published a lot of codemod tools to assist the developers in carrying out large-scale code migrations for their applications written in those frameworks. Ember.js, a popular MVC model JS framework relies heavily one codemods for their migration paths from one version to the next. Whenever there is a deprecation or breaking change introduced in the framework, the core team will ensure that they have proper backward compatibility and clearly defined migration paths with codemods. ember-cli-update is a command-line tool which updates Ember CLI Ember.js apps and addons (and Glimmer.js apps). You can run this either as a global executable available to all projects or an Ember CLI command in a single project. It also fetches list of codemods and instructions from ember-cli-update-codemods-manifest.